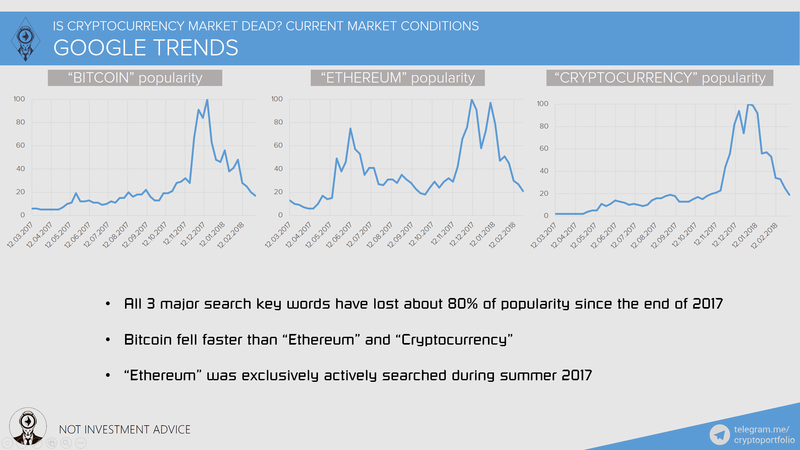 Is Cryptomarket a walking dead? Let’s find out! 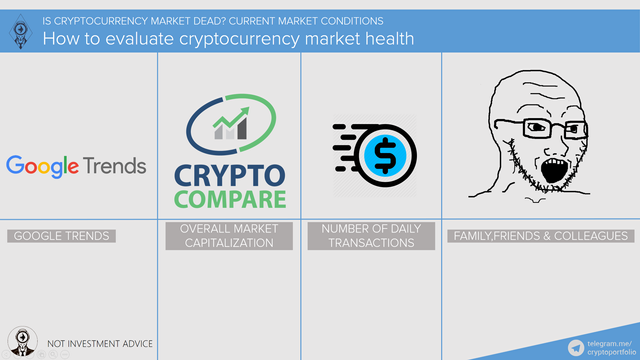 I have some interesting numbers we can use to test the health of cryptocurrency market. For now, I can tell that current market conditions are not that exciting as they were recently. And there is a noticeable outflow of people from cryptocurrencies. But based on recent news, cryptocurrencies are just starting to be used. European commission to release blockchain framework, my country (Russia) will use blockchain to protect presidential elections data, China proposes to build national crypto trading platform, and Cambodia thinks of issuing its own cryptocurrency. In order to test our patient’s pulse, we will use Google Trends. It is one of the best tools for analysing how interested people are in different topics at any given point in time. Then we’ll see what is up with the correlation between the google trends’ key words and capitalizations. 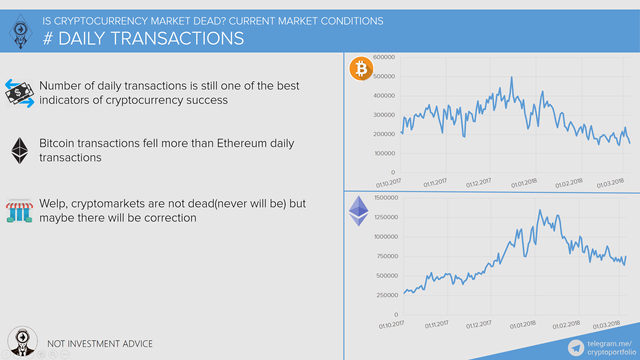 Number of daily transactions is like a blood in the veins. It will be tested today too. Finally, it is also possible to see many people who were extremely excited about certain cryptocurrencies before, silently come back to their normal lives. Hordes of people were trying to earn some easy money. But hype train stopped, passengers went to work. It is normal as every boom turns into bust. Now is the time to collect our thoughts and start productively contribute to our communities. 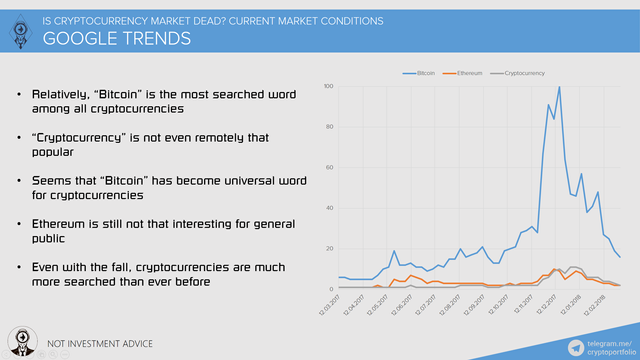 As you can see, from looking at those 3 graphs, cryptocurrencies are still of general public interest, but the peak point of interest is already behind us. Soon I will show you how important media coverage is for cryptocurrency price change. On the right part of the slide, there is a popularity comparison of different search words. Yep, the leader is still undisputable. So, here we go. The market is much more alive than it was one year ago. Isn’t it cool? 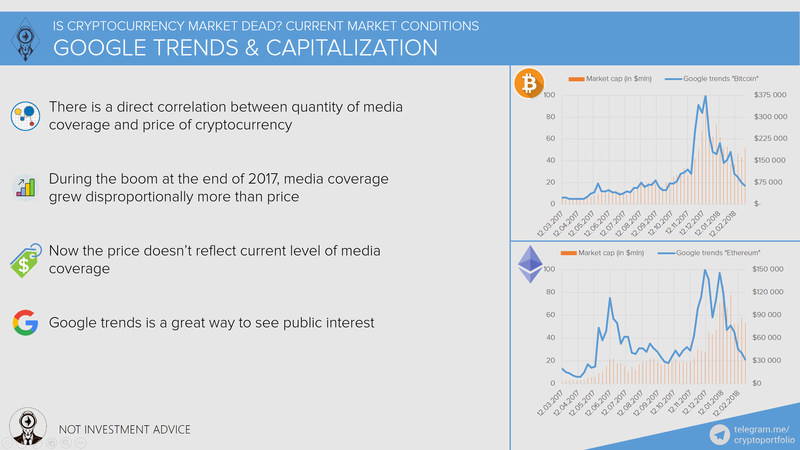 On the right part of the slide you can see the market capitalization of Bitcoin and Ethereum and their levels of media coverage. Correlation between media coverage of cryptocurrency and its price is staggering. It shows that a lot of speculative capital went into cryptocurrencies recently. I will hold on and went true these kind off market times before .... these times will let the speculators leaf and will make the people that hold on get a better understanding off what it is they are investing in ... I see this as a natural and healthy development off the market. I think we are in the middle of a slight downturn as people's enthusiasm has dipped along with the market. I feel the catalyst will be Bitcoin moving towards 20k. While many of us know altcoins, I would suggest a large portion of the population only know Bitcoin. It is only when they hear about the Bitcoin price rising they take interest in the crypto market and then find out about altcoins etc. My enthusiasm has certainly been dampened. Instead of just hoping that crypto prices go up, I'm writing more on Steemit and therefore actually using blockchain technology. I THINK U R RIGHT ,PEOPLE WANT SOMETHING NEW & BOOMING...SO BTC CAN"T GOING TO UP...make something new & attractive in blockchain & cryptomarket......it's necessary.time to time changes in any field is act of world. Well just because of the volatility in cryptocurrencies doesn't mean cryptocurrencies will be died, so i don't think cryptocurrencies will be die, just wait the price will goes up again. Wow, floored that you answered a comment. Banned from medium? That's something very rare to happen. Can you share some details why did they ban you? Did you try to object the ban? This info can help others. I'm also moving now to Steemit because of censorship on most centralized platforms, especially on Twitter. Unfortunately, it's very hard to start on Steemit without using bots, but at least nobody can ban you. I would like to think it is more of a steadying effect as crypto's begin to mature. I think no matter what we all got in this for we all knew that eventually things will kind of even out. I don't think we are there yet. I think there is still some growth to be made. Like I said, I think this lull is a bit of a maturation period. I could see you put in lots of effort to break down datas so I can understand very clearly and simple to understand....appreciated this.